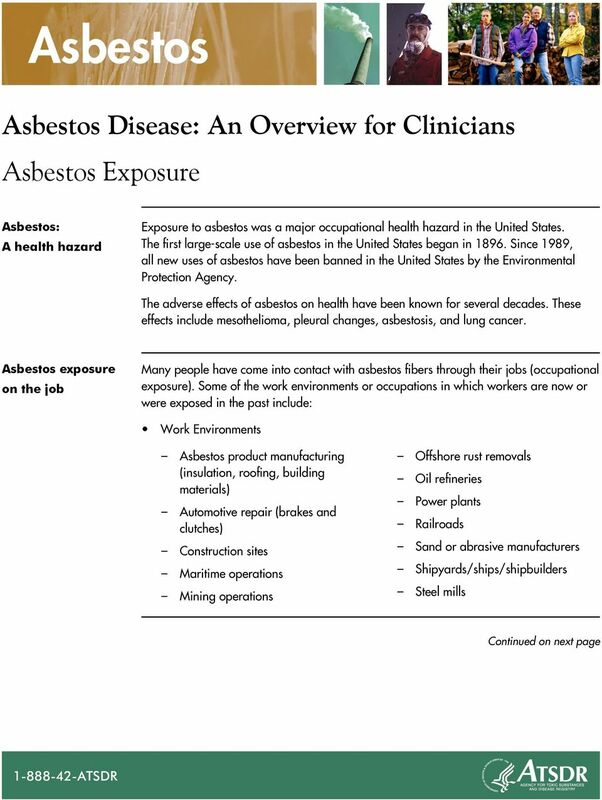 Download "Asbestos Disease: An Overview for Clinicians Asbestos Exposure"
2 Continued from previous page Asbestos exposure on the job (continued) Occupations Asbestos removal workers Workers at exfoliation facilities where vermiculite ore from Libby, Montana, was processed Demolition workers Workers at asbestos product manufacturing plants Auto mechanics Boilermakers Bricklayers Building inspectors Carpenters Drywallers Electricians Floor covering manufacturers or installers Furnace workers Glazers Grinders Hod carriers Insulators Iron workers Laborers Longshoremen Maintenance workers Merchant marines Millwrights Operating engineers Painters Plasterers Plumbers Roofers Others at Risk Exposed workers might have brought asbestos fibers home on their clothes, shoes, and bodies, and persons who lived in the same household may have been exposed. 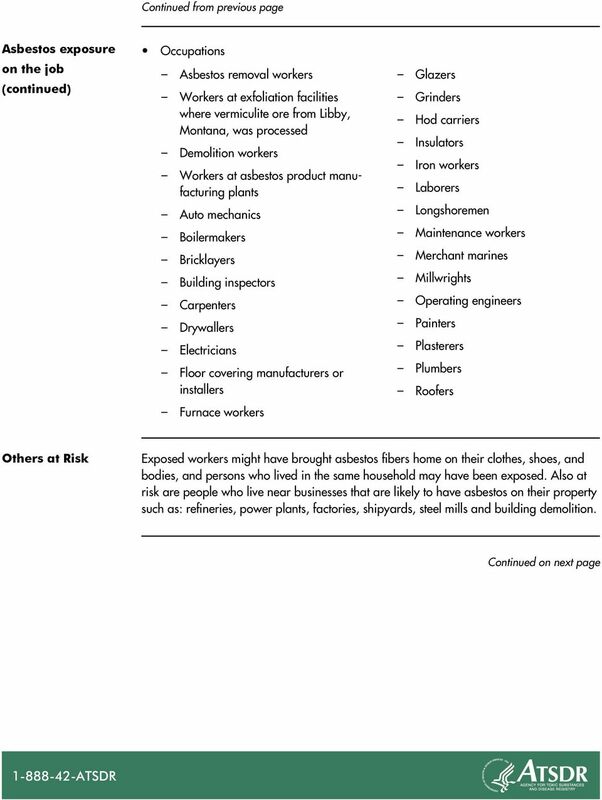 Also at risk are people who live near businesses that are likely to have asbestos on their property such as: refineries, power plants, factories, shipyards, steel mills and building demolition. 3 Asbestos-Related Disease and Risk Asbestosis and pleural disease Asbestosis is a pneumoconiosis caused by the inhalation of asbestos fibers. It is characterized by interstitial pulmonary fibrosis. It may also be accompanied by pleural disease, a thickening of the pleura with or without pleural calcification. Pleural disease may also occur in the absence of interstitial findings. In more advanced cases there may be dyspnea, dry cough, and rales. Rales are wet and crackling lung noises usually heard at the lung bases and are often called cellophane rales because of their crackling nature. Severe cases of asbestosis may cause clubbing of the fingers. Pulmonary function studies typically show a restrictive pattern. Radiographic changes may include small irregular opacities in the lower and middle lung fields, pleural thickening and pleural plaques, and pleural calcification. In less advanced cases, radiographic changes may be difficult to interpret. High-resolution CT scanning of the chest may be helpful in evaluating the patient further. Cancer All histologic types of lung cancer may be seen. However, some studies have shown a preponderance of adenocarcinoma. Mesothelioma is a rare tumor of the pleura and peritoneum that is associated with asbestos exposure. Studies of mesothelioma have been difficult to conduct because of the long latency between exposure and disease onset. This period may be as long as 30 to 40 years. The pleural tumor tends to spread along the interlobar fissures and invade the subpleural portion of the lungs. Direct invasion of the tumor into adjacent tissues and organs is common. Smoking is not associated with mesothelioma but has been shown to significantly increase the risk of lung cancer in persons exposed to asbestos or other asbestiform minerals. Assessing risk Because asbestos has been used widely in the United States, nearly everyone has been exposed to very low levels of asbestos at some time in their life. However, most people do not become ill from their exposure. The risk of asbestos-related abnormalities and disease increases with increasing levels and duration of exposure. In some cases, even short-term occupational exposures or secondary household exposures (e.g., household contacts of asbestos workers) have been associated with this disease. As asbestos exposures have declined in the workplace due to regulatory control, cases of severe interstitial disease have also decreased. Among many recently screened cohorts exposed primarily to amphibole asbestos, pleural changes are more prevalent than interstitial changes. However, in several regions of the world (including the United States), exposures from naturally occurring deposits of asbestos or other asbestiform minerals, or as a result of living near mining operations, have been associated with pleural abnormalities and mesothelioma. 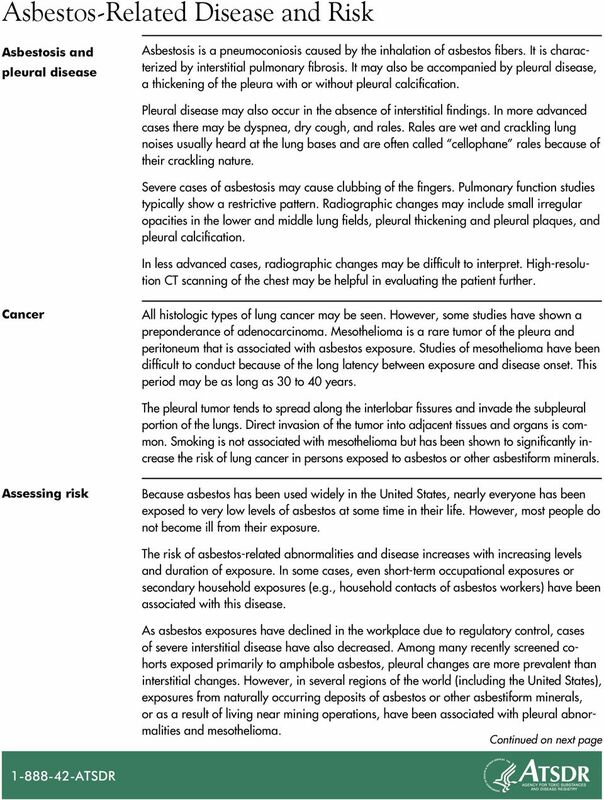 4 Continued from previous page Assessing risk (continued) The association between asbestos exposure and health effects, such as asbestos exposure and lung cancer, is well established. In the case of smokers who have had significant asbestos exposure, the risk of lung cancer is extraordinarily high. Lung cancer in asbestos-exposed workers may occur at a slightly earlier age than other lung cancers and may occur more commonly in the lower lobes. 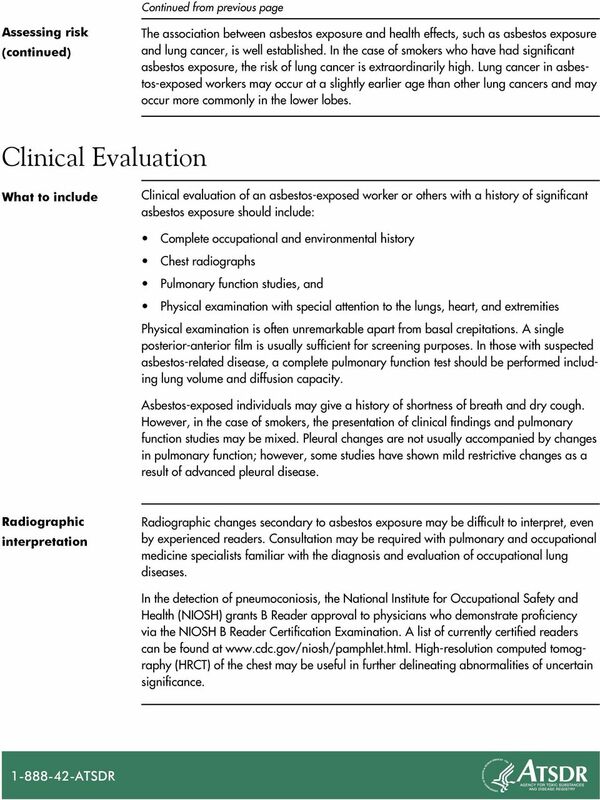 Clinical Evaluation What to include Clinical evaluation of an asbestos-exposed worker or others with a history of significant asbestos exposure should include: Complete occupational and environmental history Chest radiographs Pulmonary function studies, and Physical examination with special attention to the lungs, heart, and extremities Physical examination is often unremarkable apart from basal crepitations. A single posterior-anterior film is usually sufficient for screening purposes. In those with suspected asbestos-related disease, a complete pulmonary function test should be performed including lung volume and diffusion capacity. Asbestos-exposed individuals may give a history of shortness of breath and dry cough. However, in the case of smokers, the presentation of clinical findings and pulmonary function studies may be mixed. Pleural changes are not usually accompanied by changes in pulmonary function; however, some studies have shown mild restrictive changes as a result of advanced pleural disease. Radiographic interpretation Radiographic changes secondary to asbestos exposure may be difficult to interpret, even by experienced readers. 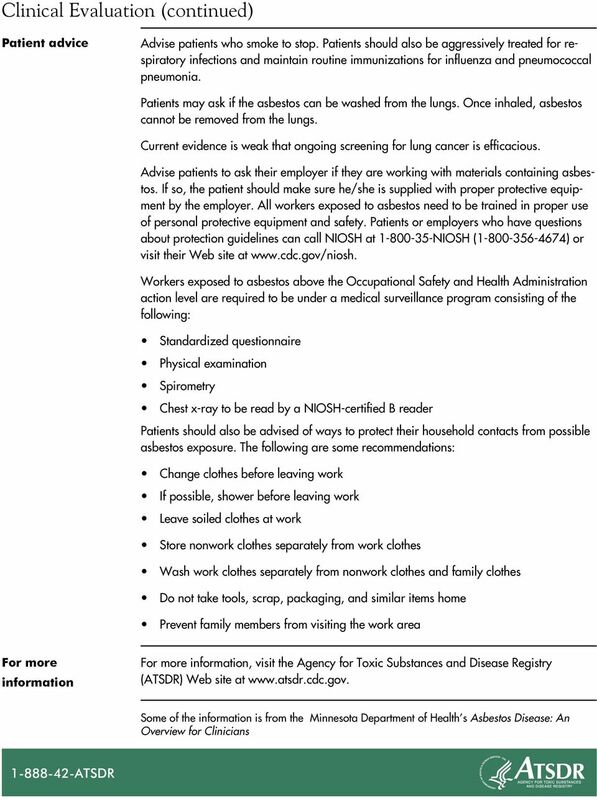 Consultation may be required with pulmonary and occupational medicine specialists familiar with the diagnosis and evaluation of occupational lung diseases. In the detection of pneumoconiosis, the National Institute for Occupational Safety and Health (NIOSH) grants B Reader approval to physicians who demonstrate proficiency via the NIOSH B Reader Certification Examination. A list of currently certified readers can be found at High-resolution computed tomography (HRCT) of the chest may be useful in further delineating abnormalities of uncertain significance. by Lee S. Newman, M.D., and Cecile S. Rose, M.D., M.P.H. Eur Respir J 2011; 38: 376 383 DOI: 10.1183/09031936.00050210 CopyrightßERS 2011 Lung function, radiological changes and exposure: analysis of ATSDR data from Libby, MT, USA D. Weill*, G. Dhillon*, L.
Asbestosis in Louisiana: A Descriptive Review and Demographic Analysis of Hospitalizations for Asbestosis, 1999-2009 Cassandra Davis, MPH; Jayaprabha Vijaykumar MD, MPH; Michelle Lackovic, MPH; James H.